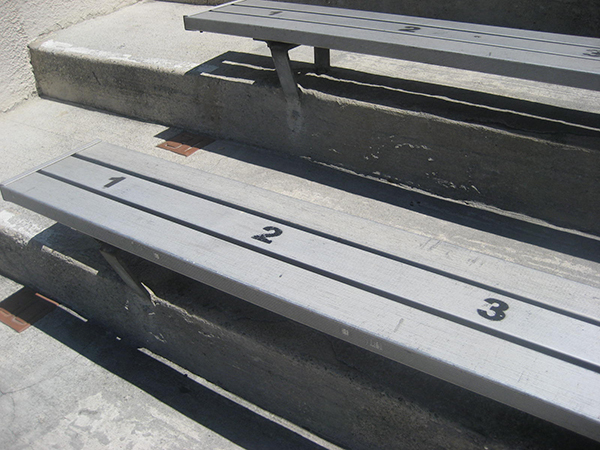 The lowest rows at the stadium start out with Row K and go backwards to row A. After the lettered rows; there are 77 numbered rows (1 lowest/77 highest). 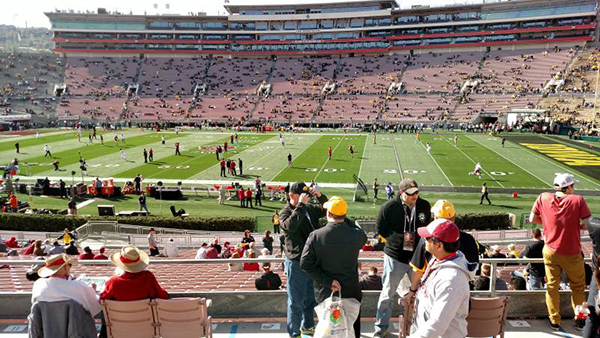 Partial and Obstructed Rose Bowl Seat Views. If you can avoid it, sitting in rows K through A can have partially blocked views although there is no label on the tickets as an official obstructed view by the Tournament of Roses. Rows K-A are on a flat surface, and your view can be blocked by the team, coaching staff as well as fans in front of you. So, what are the best seats in the Rose Bowl? 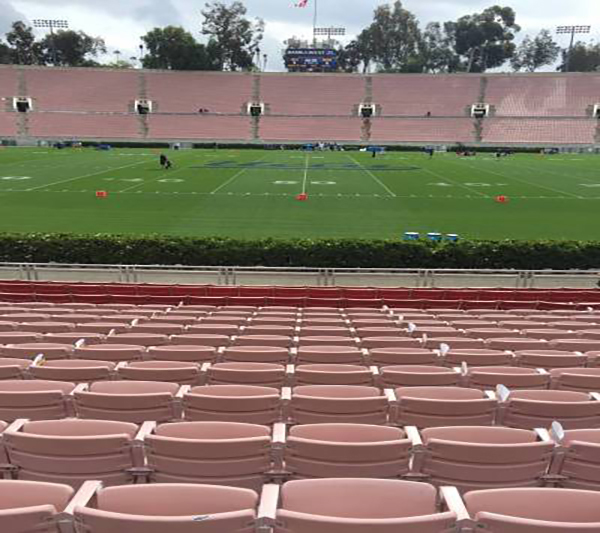 The best seats for viewing at the Pasadena Rose Bowl are in sections 3-6 as well as 17-20, in between rows 20-50. The stadium rises on a gradual slope, sitting between these sections will place you between the endzones as well as high enough to see all the action. View all available Pasadena Rose Bowl seats click the link above. Pasadena Rose Bowl Bench Bleacher Seating. 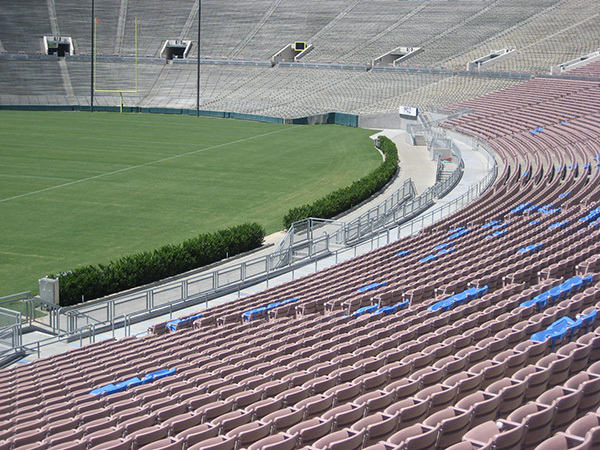 The Bleacher sections at the Rose Bowl are in both end zones, sections 22-28 as well as 8-15. These seats are just as they sound, bleacher seats with no backs. If you get uncomfortable quickly or have a bad back, we highly recommend seats along the sidelines that have backs. Sitting in sections 16-21 as well as 2-7 along the sidelines offer “seat backs,” more legroom than the bleachers as well as better lines of site for the game. Although seats with backs tend to be more expensive than bleachers, they will be more comfortable watching the three-hour event. Stadium Club Seats at the Rose Bowl. Club seats are in prime seating locations inside the Rose Bowl and come with access to the 15,000 square foot Stadium Club. The Club is climate controlled, with complimentary Wolfgang Puck dining inspired menu, full cash bars, multiple TVs and cushioned seats all overlooking the action on the football field. For availability of Rose Bowl Club Seats, for a UCLA game or the Rose Bowl game, please click on the event above. Loge Boxes at the Rose Bowl. 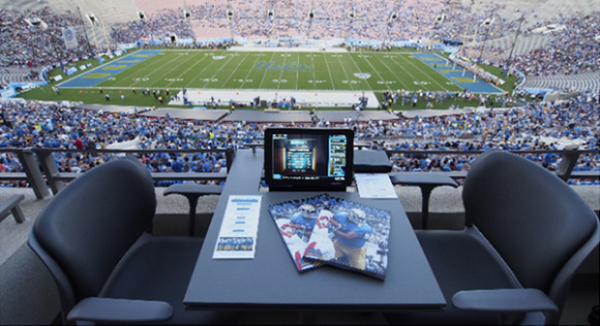 With some of the best views of the game in the stadium as well as luxurious amenities the Rose Bowl Loge Boxes offer an unmatched viewing and game experience. The 48 Rose Bowl Loge Boxes are between the 35-yard lines and feature a premium entrance to the stadium, as well as access to the climate-controlled Loge Box Lounge. Enjoy dining on a Wolfgang Puck inspired menu and non-alcoholic beverages. Spirts, beer, and wine are available at a full cash bar. Loge boxes come with 12″ flat screen monitors with both in-house feed and cable capabilities as well as private restrooms on the premium level. 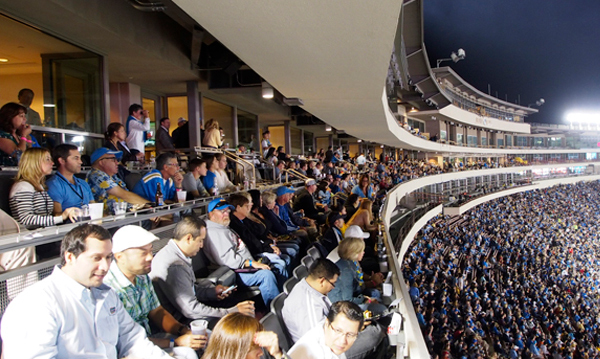 Rose Bowl Luxury Suites are the ultimate way to enjoy the game with up sixteen to thirty guests for a UCLA football game, the Rose Bowl or the hottest concert. Watch all the action while relaxing in extra-wide, cushioned exterior seats that come with cup holders. Never miss an instant replay on your flat screen tv with in-house and cable feeds as well as wifi. Indulge with a Wolfgang Puck inspired dining menu for purchase with a Luxury Suite attendant to take care of all food and drink needs. Purchase wine, beer, or spirits to enjoy in the luxury suite during your event. Luxury suites come with unmatched sightlines for all UCLA, Rose Bowl Game, Concerts as well as all other sporting events at the stadium. 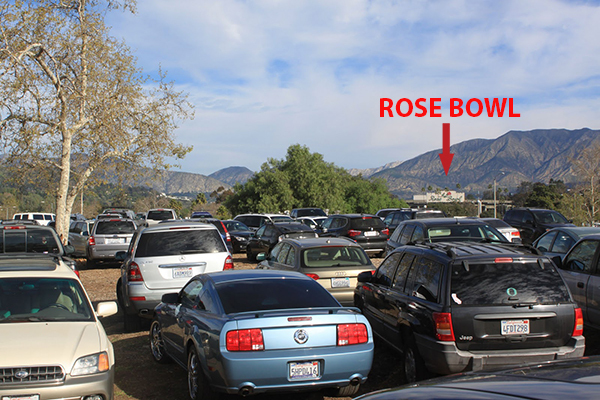 Parking at the Pasadena Rose Bowl, especially on New Years Day is notoriously horrific. The 100,000 capacity stadium sells out every year, and that is a lot of cars parking and leaving the game at the same time. If possible, we highly recommend buying a parking pass in advance of your event, and if the Rose Bowl VIP parking pass is available, they are an even better option. If you are driving to the Pasadena Rose Bowl, arrive as early as possible to avoid delays. Do they sell beer at the Rose Bowl game? Yes, beer is available to purchase at the Rose Bowl game. How many people can fit in the Rose Bowl? 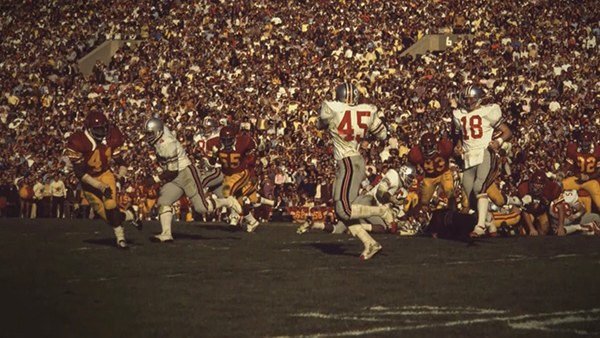 The largest crowd in the Rose Bowl was 106,869 fans for the 1973 Rose Bowl game between the USC Trojans and Ohio State Buckeyes. USC won 42-7. Where is the Pasadena Rose Bowl? Can you take a tour of the Rose Bowl stadium? 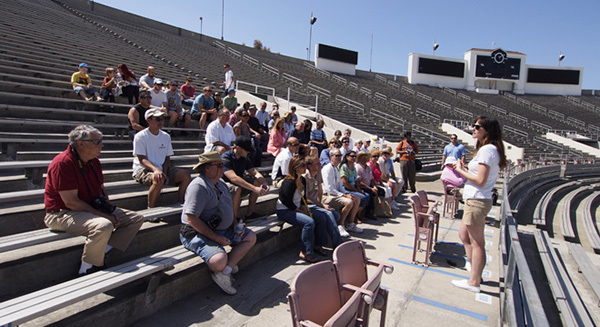 Yes, on the last Friday of every month at 10:30 am and 12:30 pm they offer Rose Bowl Stadium tours. Barry’s Tickets 100% Customer Guarantee. Barry’s Tickets guarantees that all Rose Bowl tickets are verified authentic and delivered in time for the game or your money back. All transactions are secure and backed by full-service Barry’s Tickets customer care guarantee. Full refund on your tickets if your event in Pasadena is cancelled and not rescheduled. Barry’s Tickets offers an extensive selection of tickets to all Pasadena events including all concerts, sports, and theatre events.